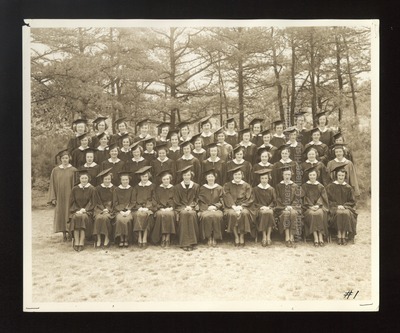 "Westbrook Junior College, Class of 1937"
Forty-seven members of the Westbrook Junior College, Portland, Maine, Class of 1937 pose with Dean Elsbeth Melville in this sepia toned Commencement photograph, taken outside at the back of the campus. Dean Melville is seated in the first row, seventh from the left. To Melville's right is Audrey White (Beyer) and to her left is Marguerite Shaw.